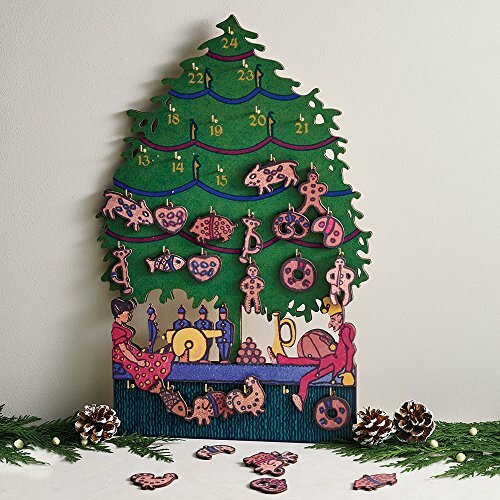 18 3/4''H x 12 1/2''W Christmas advent calendar. Made of wood with loops on the back of the calendar for hanging. Comes with 24 different cookie like ornaments and has 24 hooks. Hang a different cookie ornament each day. Created by the Metropolitan Museum. Based on art in their collection by Josef Diveky (Hungarian, 1887-1951), a member of the Wiener Werkstätte (Vienna Workshops). Part of the proceeds go to the Museum. Comes with a card explaining the design history. Use this beautiful wooden advent calendar year after year. A Christmas advent calendar based on Austrian artwork in the collection of the Metropolitan Museum of art. Part of the proceeds go to the Museum. Gift Boxed. 18 3/4''H x 12 1/2''W Made of laser-cut wood. Comes with 24 wood pieces that look like cookies. Has loops on back for hanging and metal hooks for hanging the cookies each day. Comes with a card explaining the origin of the artwork. If you have any questions about this product by MMA, contact us by completing and submitting the form below. If you are looking for a specif part number, please include it with your message.